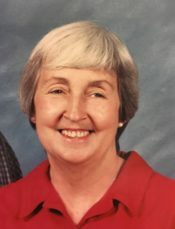 Virginia Eddins Dunson, 80 of Pensacola, Florida passed away Thursday, October 25, 2018. She was born in Frisco City, Alabama, a graduate of Auburn University and employed at Warrington and Ransom Middle Schools for 31 years. Virginia was a member of First Baptist Church of Pensacola. She is preceded in death by her husband of 51 years, Elton Dunson. She is survived by her son, Jeff Dunson; daughter, Susan Whittle (Steven); grandchildren, Taylor Howell (Colin), Andrew Dunson (Savannah), Matthew Dunson (Haley), Sarah Ricketts (Joseph), Benjamin Whittle; great-grandsons, Sawyer Dunson and Adam Howell; brothers, Riley Eddins (Mary), Fred Eddins (Pat), Paul Eddins (Sue). A service will be held at Pensacola Memorial Gardens Funeral Home on Saturday, October 27, 2018 at 2PM. The family would like to thank the staff at Cottage 6 at The Waterford of Creekside Assisted Living Facility. Jeff & Susan–I worked with your dad on the church bus ministry at FBC & then taught with your mom at Warrington Middle. I loved them both dearly. They sure touched a lot of lives including mine. My prayers are with all of you.